I wrote a preview for the French Open juniors that seemed to go down well, so I thought I would have another go for Wimbledon. Whoever wins the title will be looking at the success of the past two champions - Genie Bouchard and Belinda Bencic - and hoping to achieve the same in the coming years. Ivana Jorovic is the top seed for the girl's draw at Wimbledon, but to be honest, it is difficult to make a real argument for her being the most likely champion. Despite being the top ranked junior, she has never played a match on grass, either at senior or junior level, so to suggest that she stands a real chance of winning is tough. She has plenty of quality, which can get you a long way at this level, but there look to be players that are far more experienced on grass in this section that will cause her real problems. Her first match is against the American, Kaitlyn McCarthy, who is a former finalist of the International Grass Court Championships in the USA last summer. She should provide a real test of Jorovic's grass court credentials in the first round. Their second round opponent will be either Paula Badosa Gibert and Luisa Stefani, who are both are solid young players, but are inexperienced on grass. Katherine Sebov is a Canadian qualifier, but do not let that fool you. She is a very good grass court player as she demonstrated in a run to the quarter-final in Roehampton, eventually losing to Kristina Schmiedlova. She was a break up in the deciding set of that match and could easily have beaten the Slovakian, who lost in the final. 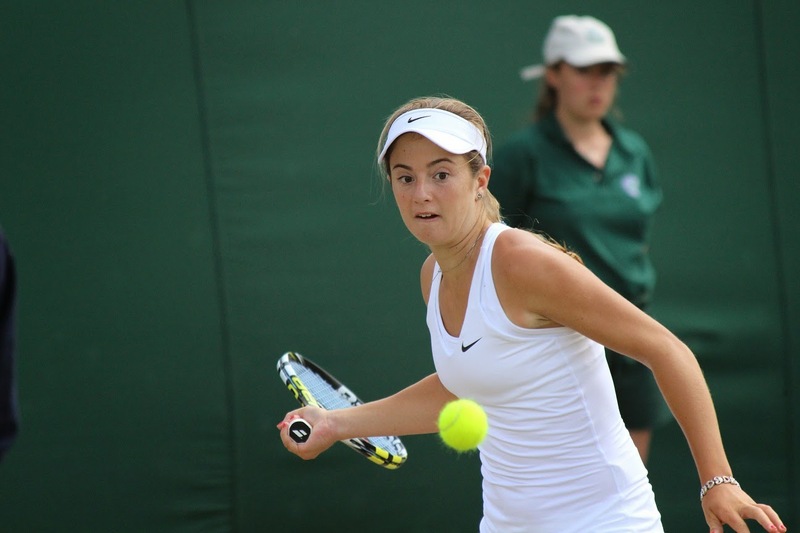 However, she comes up against another talented grass court player in Britain's Gabriella Taylor. Taylor scored the biggest win of her career in routing Sofia Arvidsson in qualifying for Wimbledon, although lost to Tereza Smitkova, but given her run in Wimbledon thus far, that is no disgrace. The other two players in the top section - Tami Grende and Anna Bondar - are both yet to record their first wins on grass. Indeed, Anna Bondar is yet to play a match on grass. It is anyone's guess who might win this, but either player is likely to struggle against Sebov or Taylor in the second round. The next section of the draw contains some very decent players. Marketa Vondrousova is just 14-years old, but was a revelation at the French Open, reaching the semi-final. She had a solid warm-up for Wimbledon with a couple of wins in Roehampton before losing in three sets to Britain's Katie Boulter. She plays Freya Christie, who gained plenty of grass court experience this week in Roehampton, reaching the third round of the singles and the semi-final of the doubles. She was unlucky in drawing Bencic and Townsend in the first round of Wimbledon and Roehampton last year and will be hoping to make the most of a slightly more fortuitous draw this time around. This should be an excellent first round match. Viktoria Kuzmova seemed to enjoy her first experience of the grass in Roehampton as she beat a series of talented players in a run to the semi-final. She put up the biggest challenge against the eventual champion, Jelena Ostapenko, and she will go into Wimbledon with plenty of confidence. She should beat Katrine Isabel Steffensen without too many problems to set up a second round clash with either Christie or Vondrousova. Neither Mendez or Hutchinson will have any real impact on the tournament, but it is the seventh seed that rounds out this quarter that could be a real threat. Two years ago, she reached the semi-final of both Wimbledon and Roehampton, where she beat the likes of Taylor Townsend and Donna Vekic. She has not really pushed on as expected and she has not played on grass since then, but if she clicks, she will be a real threat. She should cruise through the first two rounds and gain experience of playing on grass again, then it will take a good player to stop her. Tornado Alicia Black is the third seed, but she does not have a great deal of experience on grass. She had a decent win against Gabriella Taylor in Roehampton, but won just five games against Kuzmova in the second round. She has struggled a bit outside of the USA and although she is talented, it would be a surprise if she were to go all the way. She should get past Anna Brogan in the first round without too many problems though. Marie Bouzkova and Rebecca Sramkova are two good young players, but neither have shown any real interest in playing on grass thus far, so it would be a surprise were they to do much in this tournament. Again, neither Yerolymos or Ogando have any obvious grass court potential, but the last match in this top part is probably the best match of the first round. Katie Boulter reached the quarter-final in Roehampton before running into an impressive Bellis, to back up some good performances on the senior tour, albeit not with the wins she might have hoped for. Her opponent is the Australian, Priscilla Hon, who lost to eventual finalist, Kristina Schmiedlova, in three sets in Roehampton and gained plenty of time on the grass in winning the doubles. In a relatively weak section, the winner of this could easily go through to the quarter-final. The bottom half of this section is very strong. 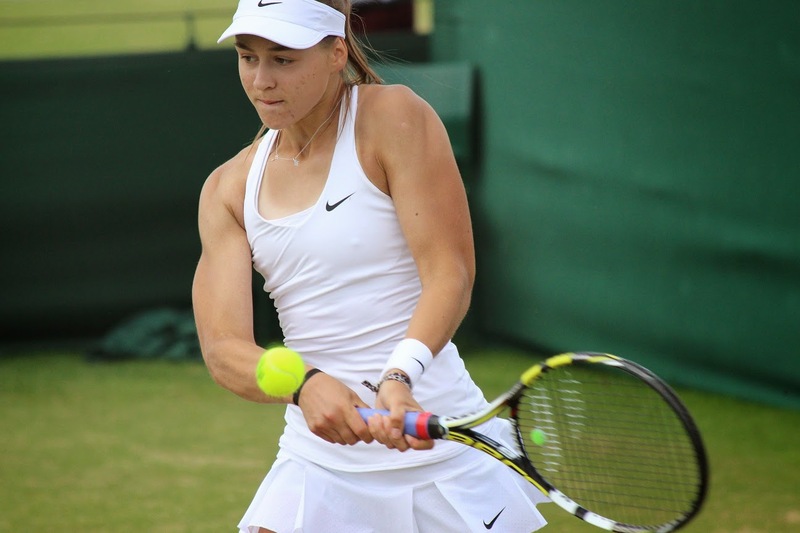 Anhelina Kalinina reached the quarter-final of Wimbledon last year as well as winning in Halle and had some decent time on court in reaching the quarter-final of singles and semi-final in doubles at Roehampton this week. Harriet Dart will not be an easy opponent though. She reached the semi-final in Roehampton last year and recorded wins against Ostapenko and Krejcikova, as well as running Ana Konjuh close. She has been gaining experience on the senior tour this season and this should be a fine match. The winner should come through their second round against either Dasha Ivanova or Qiu Yu Ye without too many issues. Jelena Ostapenko was a dominant winner in Roehampton this week, using her power to dominate opponents. She did not drop a single set and, in recent years, the Roehampton champion has done well at Wimbledon. She will have been disappointed at her first round defeat last year and is a serious contender for the title this time around. 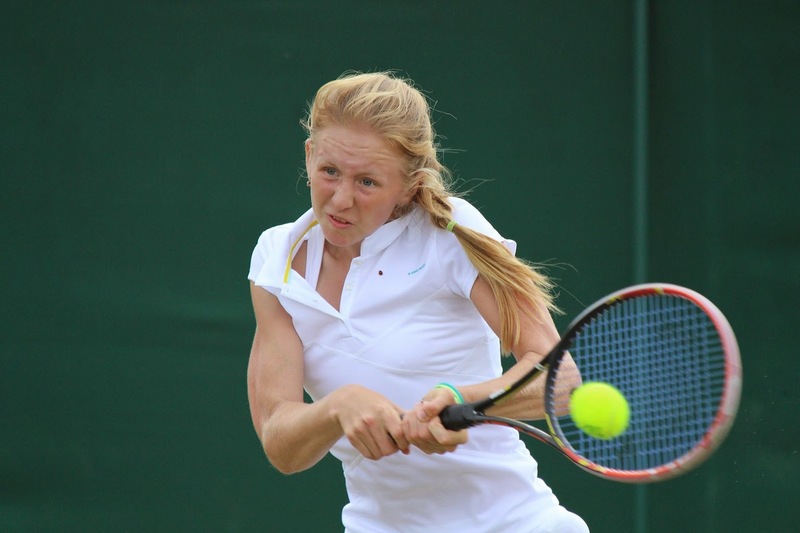 Her opponent is the 15-year old Brit, Anastasia Mikheeva, who put in some good performances at Roehampton this week, only losing to Kalinina on a third set tiebreak. She will certainly prove a tough opponent for Ostapenko, but the Latvian should come through unscathed. The winner will likely play last year's losing Wimbledon doubles finalist and Roehampton finalist, Iryna Shymanovich. She would have been disappointed with her performance in Roehampton this year, but she has grass court pedigree and a second round match against Ostapenko could be a really high quality affair. This is a relatively weak quarter of the draw. Jil Belen Teichmann is a very good young player on the clay, but has never played a match on grass, which suggests that she is not overly bothered about this surface. Similar to Jorovic in the top half, she is a talented player, which could get her through a few rounds, but it is unlikely that she will seriously challenge for the title. Her opponent is 15-year old Fanny Stollar, who has only played one tournament on grass, but did have a good win against Isabelle Wallace before losing to Kuzmova in the third round. There is every chance she could threaten Teichmann in this match. Both Evgeniya Levashova and Bianca Turati have only ever played one tournament on grass. Levashova fell away quickly against Zarazua in the end last week and had a medical timeout for a leg problem in the deciding set, while Bianca Turati had a good start against Kalinina, but was outclassed in the end. My guess is that Turati will win this and anything could happen if she gets through in this weak section. Raveena Kingsley fought hard and was fairly impressive in defeat in the first round against Vondrousova in Roehampton last week and will fancy her chances against Simona Heinova, who was another first round casualty last week, this time against Badosa Gibert. However, the player most likely to come through this section of the draw is the Chinese player, Shilin Xu. She reached the quarter-final in Roehampton before being blasted away by an inspired Ostapenko, but she has as much grass court experience as any player in this draw. I suspect she will fall short against the top juniors, but in this weak section, she should come through. Naiktha Bains is seeded in the next section, although she has no particular grass court pedigree. She had a pair of wins in Roehampton, but lost against the first decent player that she came up against. Her opponent, Greetje Minnen was beaten in the second round of Wimbledon last year against Bencic, but is a decent player on grass. Neither will challenge late in this tournament, but it could be a close match. They are likely to play the American, Sofia Kenin, in the second round, who was unfortunate enough to draw Ostapenko in the first round in Roehampton. Despite a straight sets loss, she showed enough to suggest she is a decent grass court player. The player that is most likely to progress from this section is the Turk, Ipek Soylu. She already has a pair of third round appearances at Wimbledon to her name and has plenty of experience on the grass. She would also have gained valuable big match experience from the wildcard that she received into qualifying at Miami earlier this year. She will not be troubled by Burrage in the first round. Aliona Bolsova Zadoinov is the fourth seed, but again, is a high seed with very little experience or pedigree on grass. She reached the final in the doubles at Roehampton, which will have given her some practice on the surface after being hammered in the first round of the singles by Katherine Sebov. She should have enough against another inexperienced grass court player in Ruse in the first round, but I would be surprised if she comes past Soylu in the next round. Kristina Schmiedlova is the first player in this section and will be full of confidence after a run to the final in Roehampton. It is the first time that she has really shown any form on grass and she will be hoping to carry this into Wimbledon. Her opponent, Usue Maitane Arconada, is not a bad grass court player by any means, having reached the final of the International Grass Court Championships in the USA in 2012, but if Schmiedlova plays as she did this week, it might be too big of a test for Arconada. Neither Ploskina or Birrell have any obvious grass court pedigree, although Ploskina did push last year's semi-finalist, Louisa Chirico, to three sets in defeat in the first round. Birrell had a great run in Australia, but has never played a grass court match in her junior career. Renata Zarazua battled well against an ailing Levashova last week in Roehampton after being outhit in the opening set. She came back well and backed it up with a win over Wargnier before falling to Bellis in the third round. Her opponent, Justina Mikulskyte, has played a few matches on grass before, but has struggled against some very average opponents, so I would be surprised if she is good enough to beat Zarazua here. The winner of that match will play either Katie Swan or Ioana Loredana Rosca. Swan is listed as British, but has spent most of her time in the USA and is expected to switch nationality in the future. Despite this, she will get some home support, but against a player that has won a couple of matches at Wimbledon in the past, this might not quite be enough. Rosca should come through this, but is unlikely to really challenge later in the tournament. Sandra Samir was a semi-finalist in Halle last year and lost to Townsend at Wimbledon, but has struggled a bit recently and has not played a warm-up match on the grass yet. Her opponent, Michaela Gordon, is just 14-years old and this is her first tournament on grass. She came through qualifying, so at least has some experience, but the Egyptian may well be too good in the end. She is likely to face Scotland's Isabelle Wallace in the second round. While Wallace is far from the best grass court player out there, she should have too much for Grabher in the first round, and could well challenge Samir in the second. Jana Fett should win against Dalma Galfi to set up a match against the second seed, CiCi Bellis. Bellis has been one of the form players in the juniors this year and would have been disappointed to lose in the semi-final in Roehampton. Despite the 6-4, 6-2 scoreline against Schmiedlova, there was very little between the two players in the match. She won the International Grass Court Championships in the USA last year to show her grass court pedigree. She will certainly be one of the players to beat.